What does it mean to be a Democrat in Mexico? For most of us, living abroad in Mexico is a chosen option. At the same time, most want to remain connected with the United States and care what happens there. Grateful for the opportunities we enjoy in Mexico, we recognize the responsibilities of US citizenship. In this workshop, we will try to learn what US issues we share common concern for and the best ways, in addition to our vote, for us to influence the direction of the US. What are the current best practices for funding your mission? This workshop will include: Quickly articulating your mission to present to donors, better known as the elevator speech. How to identify, cultivate and steward donors. How the two most important words in the English language are Thank You! How special events can wear out your volunteers, and you, and what is their purpose. How the personal appeal is the most effective tool for long-term sustained financial security. Our first speaker, Robert Reich, is a celebrated American political commentator, professor, and author who served in the administrations of Presidents Gerald Ford, Jimmy Carter, and Bill Clinton. He was Secretary of Labor from 1993 to 1997 and a member of President-elect Barack Obama's economic transition advisory board. He is currently Chancellor’s Professor of public policy at the University of California Berkeley. 6:15 Book signing of his latest book, The Common Good. Reich’s book is available on Amazon.com to ship to Mexico! There will be a cash bar reception during the book signing. Genaro Lozano writes weekly in the newspapers of the Reforma Group and conducts daily "Foro Global". Presentation on: 1. US politics from the perspective of a Mexican political analyst. 2. Guidelines on how to have impact on MX media. 3. AMLO & perspective on the new Mexican Government. 2:30-	3:20	Leadership Development Workshop 3: Strategy for Effective GOTV Campaigns. Presented by Barbara Erickson. A quick overview of important considerations when planning your GOTV efforts from FPCA to ballot return. Includes important do’s and don’ts as well as target dates for 2020. We know GOTV gets Dems elected, but what do we do in between elections? We have lots of work to do to grow our numbers and keep them involved. An active organization is an attractive one. But just like with a successful election, no one way can do it all! Democrats need to keep the tent flaps wide open. In this workshop we will try to learn ways to include other individuals and join efforts with other organizations with whom we share common goals. 4:20-	5:00	Announcements concerning AGM 2020. El Charco Hike: 8:30 am - 10:00 am: The entry fee is about 50 pesos. Your volunteer experienced guide will be Michael Burns. Minimum of 4 persons (maximum 15). Historical Walking Tour: 10:00 am - 12:30 am: 300 pesos to support Patronato Pro Niños. Tour Mask Museum 10:30 am: Suggested donation is 50 pesos. Sketch Your Way Around SMA with Meagan Burns 11:00 am - 1:30 pm: $25 USD or $500 pesos per person, a minimum of 2 participants, but no more than 6. La Presa Allende Paddle 6:00 pm - 8:00 pm: 300 peso/ kayak, paddle, PFD rental. Minimum of 4 persons (maximum 15). 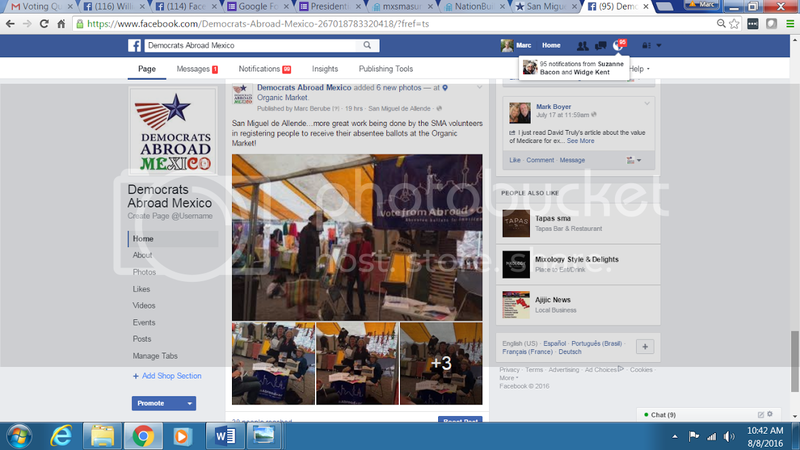 The Annual General Meeting of Democrats Abroad Mexico is being held in San Miguel de Allende. Be inspired by the highly celebrated progressive professor and author from UC Berkeley, Robert Reich and the acclaimed Genaro Lozano, political scientist and journalist from Mexico City. We have only 16 months before every Democrat living in Mexico gears up for our Get Out the Vote to bring an end to the Trump Administration! Join us in San Miguel de Allende as we learn what specific actions we can take in our Chapters all across Mexico between now and GOTV. All are invited to join the various Chapters that will be hosting 4th of July Events! 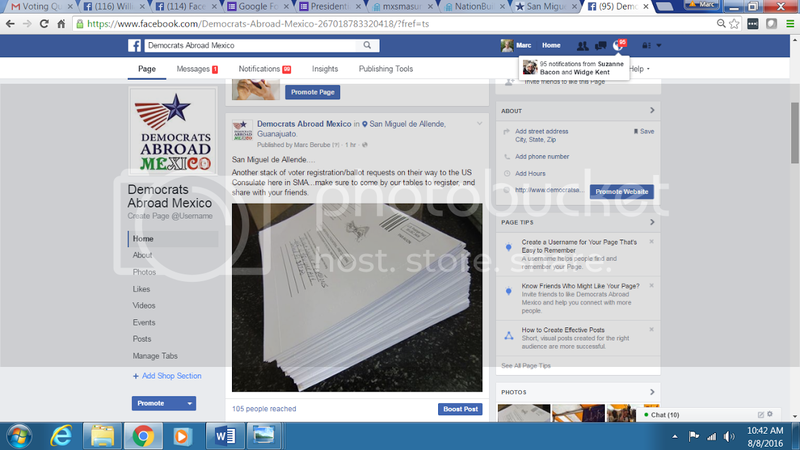 Democrats Abroad Mexico City (DACDMX) trained 13 people on August 14 in an event held at the American Legion. The newly trained volunteers will now fan out across Mexico City in an effort to register U.S. citizens for the November 8 general election. About half of the new volunteers hold joint U.S./Mexican citizenship. DACDMX will set up booths in public places such as parks and commercial centers throughout Mexico City to attract potential new voters. The volunteers will also assist existing voters in requesting absentee ballots and returning those ballots to election officials in the U.S. It has been estimated that there are up to 1 million U.S. citizens living in Mexico with half of them holding dual nationality. Registration efforts will continue until October. DACDMX plans to hold additional voter registration training sessions. The sessions are open to the general public. Huge Turnout for DACDMX "Watch Hillary's Acceptance Speech"
More than 60 people packed the American Legion in Mexico City Thursday night to watch the acceptance speech by Democratic presidential nominee Hillary Clinton. The event was covered by journalists from Reforma newspaper, the Associated Press, Reuters, and the Mexico City News. 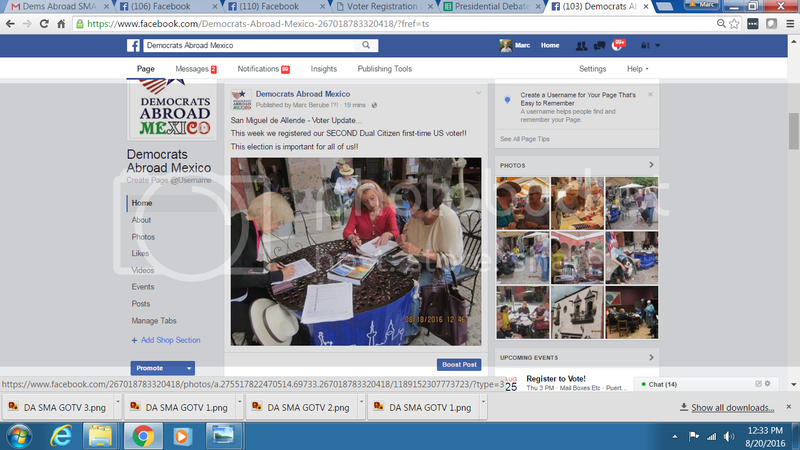 The convention watch party was one of several events planned by Democrats Abroad Mexico City (DACDMX) to promote voter registration and get out the vote efforts. Other events are planned for the presidential and vice presidential debates. DACDMX organizers suspect that last night's overflow crowd indicates the debate watch parties will be well-attended. Many of last night's attendees were newcomers to Democrats Abroad. 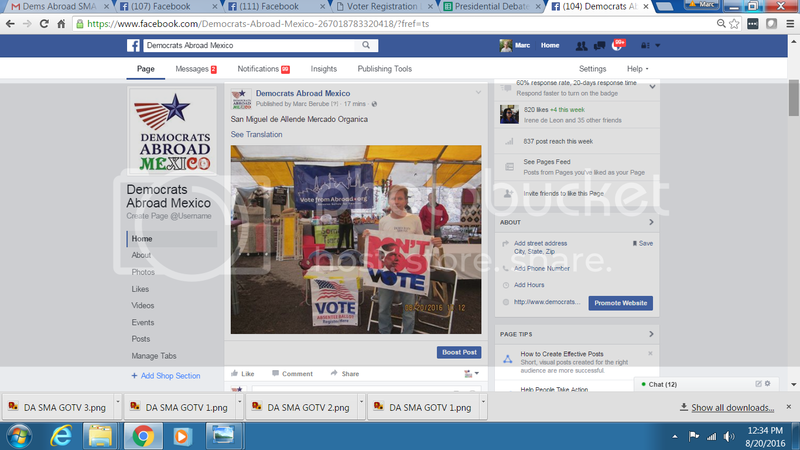 Stay in touch with DACDMX by joining Democrats Abroad Mexico at http://www.democratsabroad.org/mx. Greetings!! 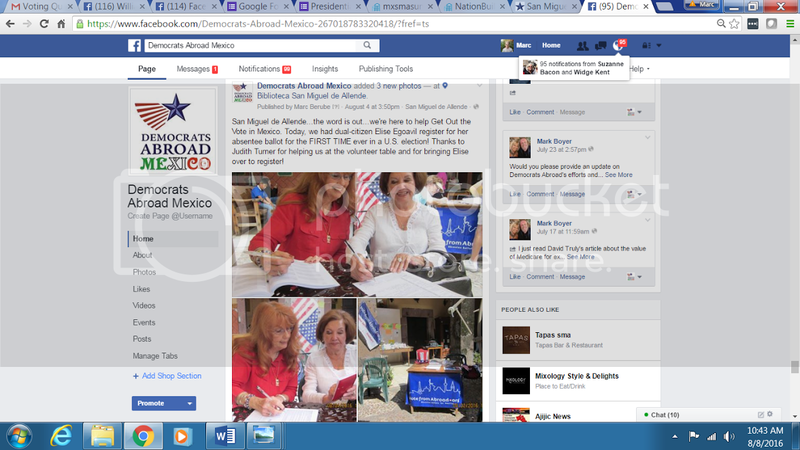 We are writing to let you know that Naomi Siegmann, Carolyn Lippert, Julie Juliano and Michael K. Schuessler are doing everything humanly possible to revive our local chapter of Democrats Abroad CDMX. In this way we attempt to honor the vibrant legacy left to us by our dearly departed Mexico City Democrat Susannah Glusker. We miss you Susannah but we must carry on!!! We have decided that the best time to accomplish this goal will be during our annual Fourth of July Picnic, to be held Sunday, July 3rd, @ 1PM at the beautiful home of artist and fellow democrat Naomi Siegmann, located in El Pedregal de San Angel. At that time we will call to order a general meeting and will hold elections. We will also have people available to help everyone register to vote from abroad via the Internet and will be happy to register people of any political party. We would also be thrilled if everyone who attends could bring –pot luck style- a dessert, a salad, baked beans etc., basically whatever you want or whatever is easier for you to manage. We are also looking for several VOLUNTEERS who can arrive an hour or so before the event to help set up and stay a bit after to clean up. Please remember that this is an INCLUSIVE event – all are welcome: Democrats, Republicans, Independents, Undecided, citizens of Mexico, US citizens, etc. Please invite your friends – just forward them this invitation and ask them to RSVP to one of the email addresses below. ALSO, if you feel that the 150.00 pesos represents a financial hardship, just let us know and we will work something out. Obviously, if you bring your kids, we won’t charge per person, but we ask the parents to give the donation they feel appropriate. Please recall that the only reason we charge anything at all is in order to recuperate personal expenditures. Thanks so much and please, REMEMBER TO CONFIRM ASAP! ​Upon confirmation, you will receive a separate email with Naomi's street address. ​We look forward to seeing you on the 3rd!